1st lunar month of 1688: Jûemon goes from his native Kyôto to Edo and plays at the Yamamuraza in the new year drama "Heishinnô". Fall 1693: Jûemon goes back to Kyôto. 11th lunar month of 1693: Jûemon becomes zamoto and produces for the nadai Miyako Mandayû Tominaga Heibei's drama "Budô no Tassha", in which he plays the role of Ishidô Satayû. His stage partners are Shibazaki Rinzaemon I, Sakurayama Rinnosuke I, Kirinami Senju I, Sodesaki Karyû, Sugiyama Kanzaemon I, Adachi Saburôzaemon and Sendai Yagoshichi. 3rd lunar month of 1701: Jûemon's rank in the Ôsaka hyôbanki, tachiyaku section, is jô-jô (superior - superior). 11th lunar month of 1701: Jûemon plays in Ôsaka the role of Tsuribune Sabu in the kaomise drama "Yadonashi Danshichi Shichinenki". His stage partners are Kataoka Nizaemon I (Danshichi Kurobê) and Takioka Hikoemon (Issun Tokubê). 3rd lunar month of 1707: Jûemon's rank in the Ôsaka hyôbanki, tachiyaku section, is jô-jô-(shiro)kichi (superior - superior - (white) excellent). 3rd lunar month of 1709: Jûemon's rank in the Ôsaka hyôbanki, tachiyaku section, is jô-jô-kichi (superior - superior - excellent). Fall 1709: Jûemon goes to Kyôto. 11th lunar month of 1709: Jûemon plays the role of Iwakura Tamiemon in the kaomise drama "Kokonotsu Kogura Hitotsubu Manbai", which is produced by Miyako Mandayû for the nadai Hayagumo Chôdayû. 3rd lunar month of 1710: Jûemon's rank in the Kyôto hyôbanki, tachiyaku section, is jô-jô-kichi (superior - superior - excellent). Fall 1713: Jûemon goes to Edo. 11th lunar month of 1713: Jûemon plays at the Ichimuraza in the kaomise drama "Yoshitomo Kaikeizan". His main stage partners are Ichikawa Danzô I, Asao Jûjirô, Mizuki Kikusaburô and Jûemon's disciple Ogawa Zengorô I. 2nd lunar month of 1714: Jûemon's rank in the Edo hyôbanki, tachiyaku section, is jô-jô-kichi (superior - superior - excellent). Fall 1714: Jûemon goes back to Ôsaka. 11th lunar month of 1714: Jûemon plays the role of Mochizuki Kurozaemon in the kaomise drama "Yonedawara Mangoku no Minato", which is produced by Shinozuka Shômatsu II for the nadai Ôsaka Tazaemon. 11th lunar month of 1715: Jûemon moves to Kyôto and plays in the kaomise drama "Chiyogasane Kiku no Shinpai", which is produced by Yamatoyama Jinzaemon I for the nadai Hayagumo Chôdayû. 11th lunar month of 1716: Jûemon plays in Kyôto in the kaomise drama "Eboshidakara Mangoku no Kaname", which is produced by Sakakiyama Shirotarô I for the nadai Miyako Mandayû. 11th lunar month of 1717: Jûemon plays in Kyôto the role of Amanohashi Yukienojô in Sadoshima Saburôzaemon's kaomise drama "Iwao no Matsu Manbai no Midori", which is produced by Miyako Mandayû in his theater. 11th lunar month of 1718: Jûemon plays in Kyôto the role of Aomi Gôsuke in Adachi Saburôzaemon's kaomise drama "Shiga no Miyako Kogane no Hanazono", which is produced by Yamatoyama Jinzaemon I for the nadai Ebisuya Kichirôbê. Fall 1719: Jûemon goes to Ôsaka, after 4 seasons spent in Kyôto. 11th lunar month of 1719: Jûemon plays in the kaomise drama "Odaki Medaki Kogane no Hajimari", which is produced by Arashi San'emon III at the Higashi no Shibai. 11th lunar month of 1720: Jûemon moves to the Kado no Shibai and plays in the kaomise drama "Hana Yakata Chibikizuru", which is produced by Kirinoya Gonjûrô I. 11th lunar month of 1721: Jûemon moves back to the Higashi no Shibai and plays the role of Kurayama Daigaku in the kaomise drama "Tenryû Chiryû Kogane no Suzunari", which is produced by Arashi San'emon III. 11th lunar month of 1722: Jûemon moves to the Ônishi no Shibai and achieves a great success by playing the role of Ishidô Sukeemon (in reality Ikoma Gengo) in the kaomise drama "Genji Moyô Ichimai Gushi", which is produced by Yamatoyama Jinzaemon II (who celebrates his shûmei). Fall 1723: Jûemon goes to Kyôto, after 4 seasons spent in Ôsaka. 11th lunar month of 1723: Jûemon plays the role of Tagamatsu Sanzaemon in the kaomise drama "Manchô Chitose-gura", which is produced by Arashi Sanjûrô I for the nadai Ebisuya Kichirôbê. 11th lunar month of 1724: Jûemon plays the role of Koizumi Kambei in the kaomise drama "Yomeiri Miyako no Shimadai", which is produced by Ogino Umenosuke for the nadai Ebisuya Kichirôbê. 11th lunar month of 1729: Jûemon plays in Kyôto in the kaomise drama "Fukuju Yakata Wagô no Futabashira", which is produced by Sakakiyama Shirotarô I for the nadai Kameya Kumenojô. 1st lunar month of 1730: Jûemon's rank in the Kyôto hyôbanki, oyajigata section, is jô-jô-kichi (superior - superior - excellent). He most likely retires in 1730 and dies in Kyôto the following year. Osagawa Jûemon was an outstanding Kamigata tachiyaku actor, who was active on major stages from 1688 to 1729. "He had been a samurai in daimyô service, and became an actor from choice. As revealing the sentiment of the time, it is recorded that one of his relatives came to the theatre to kill him because the ex-samurai had the insolence to act under his own name. This the relative considered a piece of great effrontery, and but for the pacification of the theatre people would have carried out his intention. 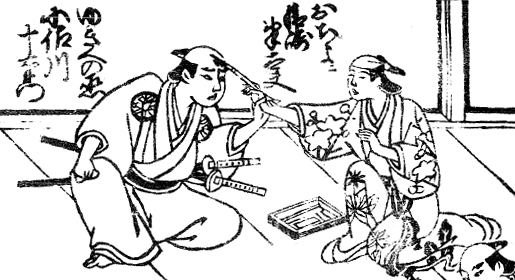 Osagawa Jûemon was good, as might have been expected, in samurai rôles. He lived to a ripe old age, and when he became too infirm to appear as a fighting man, contented himself with old men's rôles. Before his death he lost his sight, but still his usefulness upon the stage did not cease, for he was accommodating enough to act blind characters."